"A blend of assam and kenyan leaves." There were no instructions so I used my usual 5 minutes brewing time and added a little milk. Lighter than my standard teas but still a light brown, tea colour. There is a hint of bergamot but the predominant aroma is that of black tea. This is a very pleasant blend. Perhaps it's a gateway tea to those who don't currently like Earl Grey as it tastes like normal tea with a hint of bergamot. It is very refreshing and a great way to start the afternoon. The fact that it comes packaged with cake doesn't harm it either! This week I attended the 4th annual Biomedical Imaging Institute Showcase. It was very interesting to see new MR applications and to see a study that I was a subject in being presented. Also I managed to get the annual free mug, which of course I can now use to drink tea! A refreshing afternoon blend which comes with a cake :) Lovely. 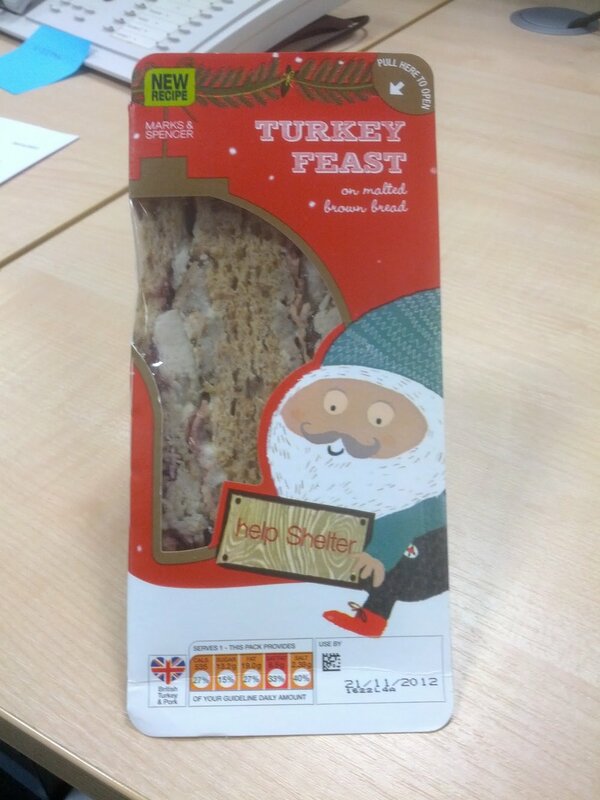 This week it is time for the king of the Christmas sandwiches IMHO - the M&S sandwich! Will it retain it's crown? Taste: The stuffing is very tasty, you can taste the sage & onion. A small amount of mayonnaise makes the sandwich moist enough without overpowering. It could do with a bit more cranberry sauce but when you get a whole cranberry it is splendid. The turkey has a lot of flavour as opposed to in the others to date where it was indistinguishable from chicken. Conclusion: Still excellent and the best so far. Will another sandwich topple it in the following weeks?